Nifty at 7973: Back where it all began! On the monthly charts, the Nifty needs to close above 7973 above which Nifty could get into a turbo mode and head towards 8410. This market has the ability to surprise us time and again. In the months of Jan & Feb 2016, Nifty was heading down the barrel; it descended from 7973 to a low of 6825, a crack of 16%. However, the low of general budget day proved to be a game changer. Not only in preceding sessions post the budget, Nifty recovered lost ground but the ferocity of the pullback has butchered the bears. After a terrific rise in last eight weeks, bulls appear relaxed sipping their cups of coffee celebrating the uptrend. However, traders need to be patient during the consolidation phase. There are several overhead resistances at play, which could make the ride a bit bumpy from here on. Let’s wind back the clock by four months and understand the importance of the high of January 2016 (7973). This is the point from where the carnage unfolded on Dalal Street. The high of Jan has so far not been breached on a closing basis. 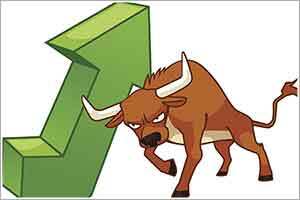 On Thursday, Nifty made a peak of 7978, but closed lower at 7912. Moreover, the 100% extension target of runaway gap seen on 13th April was placed at 7978 which was hit on Thursday’s session. This same figure coincides with the 50% retracement of the entire move from the peak of 9119 in March 2015 to the Feb lows of 6826. As an avid chart watcher, I often tend to follow the rule of 50% i.e. that every move will eventually retrace back to 50% of the earlier move. The same theory proved fruitful while catching the bottom at 6826 (which was 50% retracement of the entire move from 4531 to all time high of 9119). So this time around, current rally from low of 6826 has also retraced 50% of the earlier downfall from peak of 9119. The weekly chart of Nifty given below illustrates the logic of 50% rule. Now this does not mean that a sharp corrective wave is in the offing. Index could always go through periods of sideways correction. What has worked so far in last six weeks is the strong momentum and stable global cues; the pace of recovery was much stronger as it took fewer days to recover from the previous fall. Let me rephrase it in number of days; it took around 40 sessions from January 2016 for Nifty to fall from 7973 towards the low of 6826 and in comparison, it took around 32 sessions to recover this decline. After this strong recovery, we are looking towards sideways correction as index digests its recent gains. Index could turn choppy in the near term but in the medium term things will get rosy. On monthly charts, it is imperative for index to register a close above 7973 above which Nifty could get into a turbo mode towards 8410.